Car models coming out at the moment are offering quirky and innovative features that are making our travelling experiences far more enjoyable. These new features are cropping up as automakers attempt to stand out from the crowd; here are some features that have emerged recently around the globe. Struggling with your groceries? 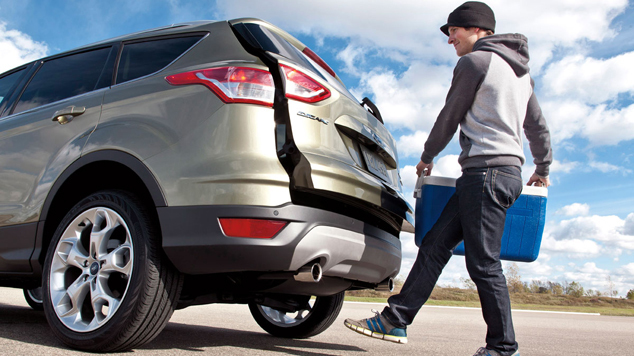 Wave your foot under the back of a 2013 Ford Escape to pop open your boot. Although this feature has been in circulation since 2005, the recent Infiniti model will physically apply breaks on the side in which you’re turning, stopping you from a potential crash by veering you back into your lane. If you’re going under 30kph, the new Ford Fiesta will implement automatic breaking to avoid collisions. Passenger Seat Shoe Compartment We wouldn’t go as far as to say this idea is ‘innovative’, but we’ve certainly not heard of it before. We can definitely imagine someone out there actively using this new characteristic to the Ford Fiesta. Car accidents related to drivers distracted by their smart phones is on the increase. The 2013 Nissan Altima is addressing the issue – their system will read text messages aloud, allowing the driver to respond by voice command or a steering wheel-mounted button that sends automated messages.